former Additional Director General Artillery. With regards to the defence issue, there is no doubt that both countries respect the current Permanent Court of Arbitration ruling and they agree to the freedom of navigation on the high seas. To further strengthen our defence relationship India has extended a $ 500 million dollar Line of Credit for purchase of defence equipment. The equipment to be procured is not known but there is a high probability it could be frigates, submarines or the BrahMos missile. Vietnam has signed a contract with L&T for the purchase of four Offshore Patrol Vessels. 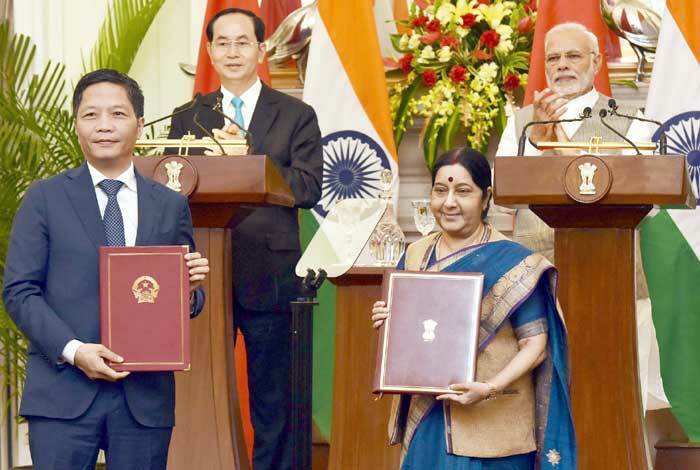 In addition, India has given a grant of $ 5 million for the construction of an Army Software Park at the Tele Communications University in Nha Trang. Further to assist surveillance there will be cooperation in downloading images from Outer Space to provide real-time picture of activities in Vietnam’s Area of Interest. Ever since we became strategic partners there has been an annual Strategic Defence Dialogue with the Indian Defence Secretary representing India. Considering the intensity of our relations, the upgradation of these talks to the Ministerial levels would be necessary.